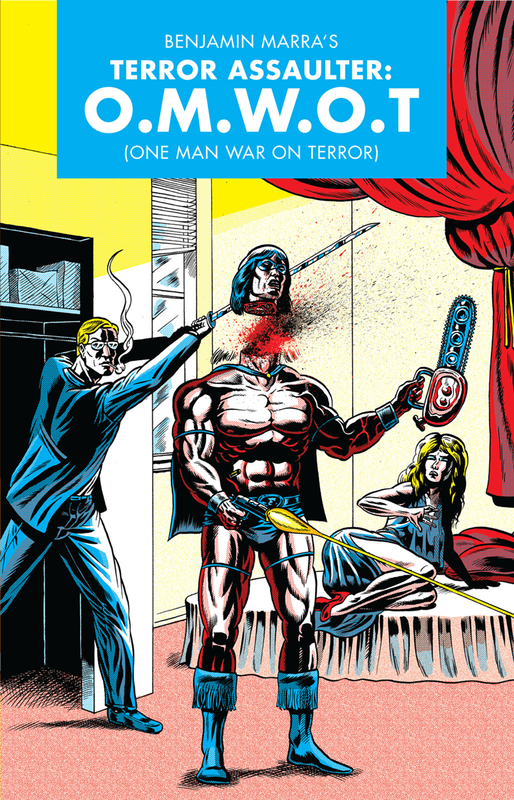 Keith Silva and I put our collective noggins together and try to figure out what the hell is going on in Benjamin Marra's TERROR ASSAULTER: O.M.W.O.T. "But hard times deserve hard commentary and slick Swiftian satire, right? And it appears O.M.W.O.T. fits the bill of fare here in this pre-apocalyptic hash house serving, as it does, crude crudités, moist meatballs, and a thick apple pie with a slab of cheddar stuck in it like a caseiculture hammer. There’s a jukebox in the back corner stocked with the entire discography of both Ted Nugent and Lynyrd Skynyrd. Every waitress is named Blanche and they all have an ax to grind about Syrian refugees. Sweet gibbering gobstopper, it sure does take a thick stomach full of hot bile to macerate what Marra is cooking, doesn’t it? But we breed them big here in America. I mean, it unquestionably takes a capacious, dumb mouth to ingurgitate and bloviate simultaneously. Thank goodness we have a 24 hour news cycle to provide us with role models in that game."